The timing of Aircraft Carrier: Guardian of the Seas is perfect. While injecting scenes of naval battle history and warfare, the main arc concerns the Rim of the Pacific. 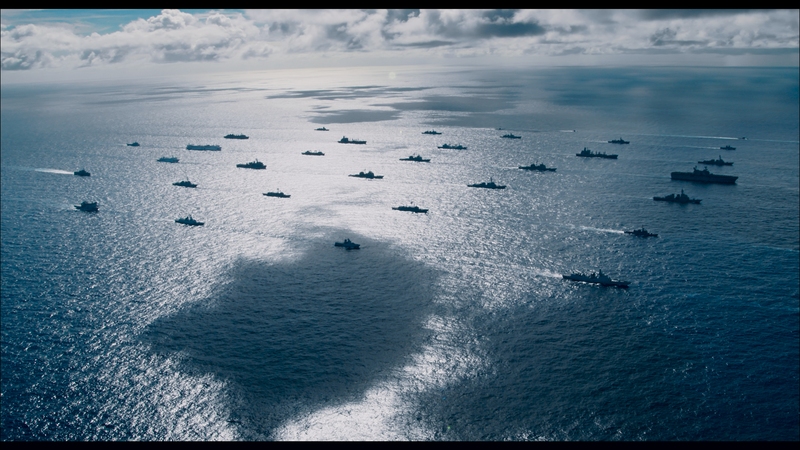 That’s an international naval exercise with thousands of people working together in simulated war games. Japanese, Korean, German, American, and others bring their ships together on neutral waters as one. It’s reassuring to see in seemingly tense times. 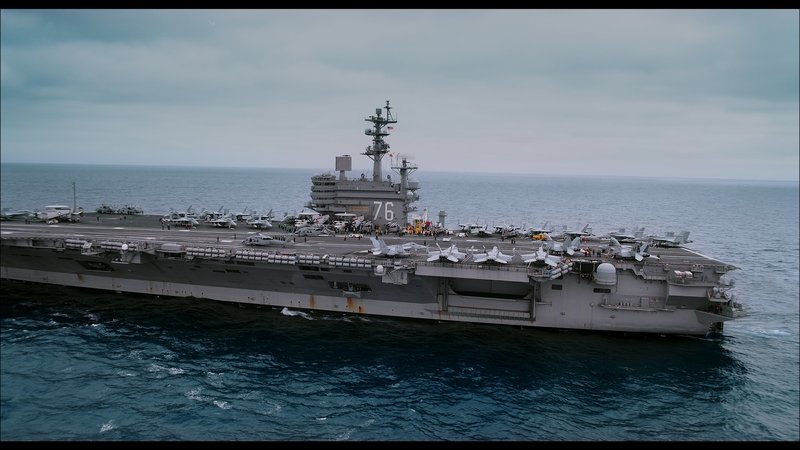 Marvelously shot with sweeping views at sea from aerial cameras, Aircraft Carrier: Guardian of the Seas’ best footage provides unique, dazzling views of warships. Jets land on their surface with IMAX cameras capturing the process whole. When in the air, aerial views alongside those planes impress too. Using CG recreations, the documentary dives into the bowels of these ships, dissecting some key functions and tech advancements. Historical footage adds context, and while not up to the quality of footage elsewhere, it’s needed. In terms of scale, modern carriers earn their due as marvels. 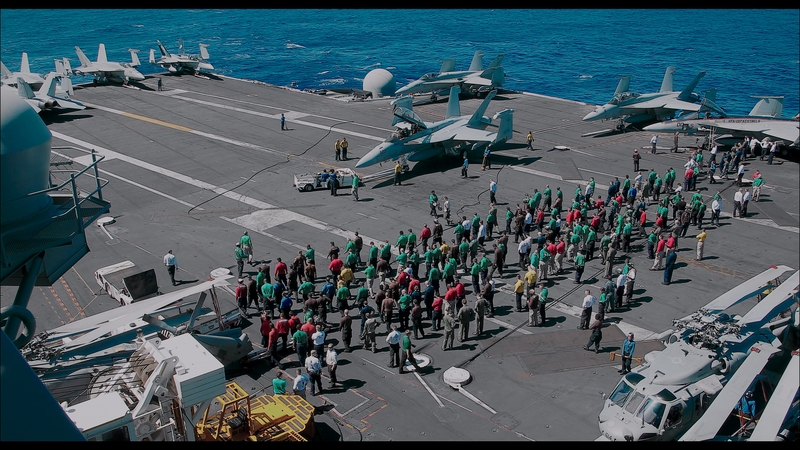 For 40-minutes, Aircraft Carrier: Guardian of the Seas celebrates the work aboard these machines. 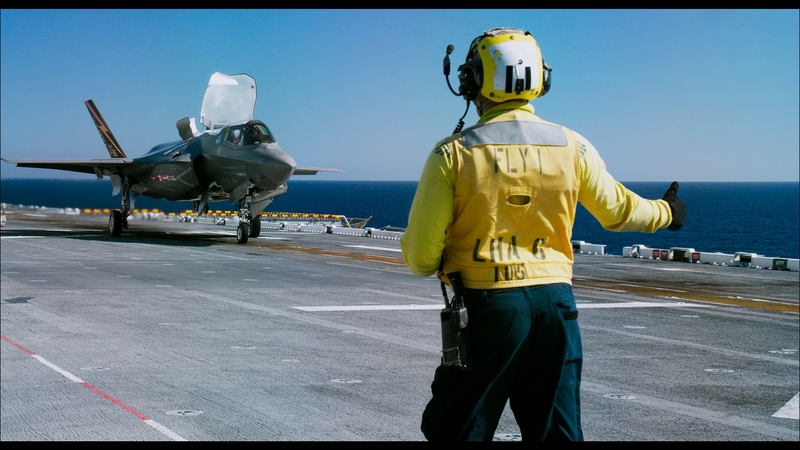 Thousands of Navy members diligently perform their duties, and appropriately, Aircraft Carrier: Guardian of the Seas gives them a chance to be on camera. Otherwise, it’s a slew of at-sea footage, with spectacular jet take-offs and once-in-a-lifetime images of forty some ships peacefully together in open water. That’s what IMAX was created for, even if the documentary material is on the thin side. After some flawless, format-perfect IMAX 4K releases from Shout (Dream Big especially), here’s the first bummer. Sadly sharpened, the mountain of agitating halos and their effects ruin what’s clearly gorgeous imagery if left untouched. Flicker and aliasing both appear, further hampering clarity. There’s an additional layer of needless noise reduction. People appear waxy. Skylines show banding. Long shots look murky and ill-defined. Resolution is evident, but digital manipulation dampens the visual prowess. Vintage footage, at times, displays great detail. Although marked by damage and dirt, some of the stock material appears fully restored. Others barely rise to SD levels. 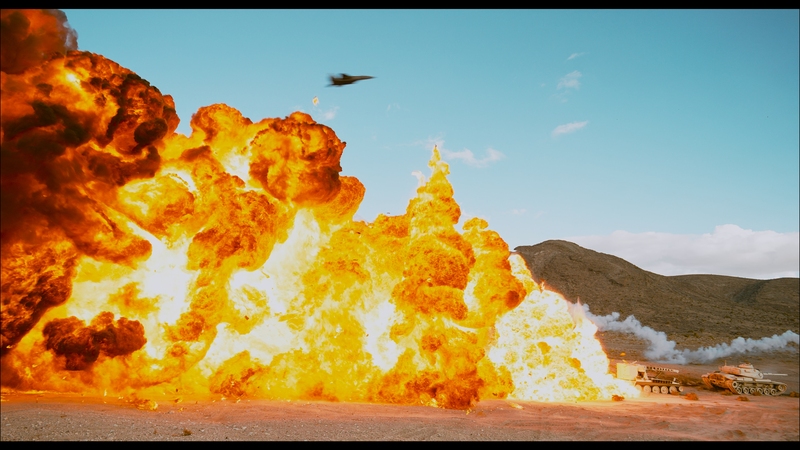 Some modern footage endures heavy artifacting, impacting these scenes. At least it’s colorful. 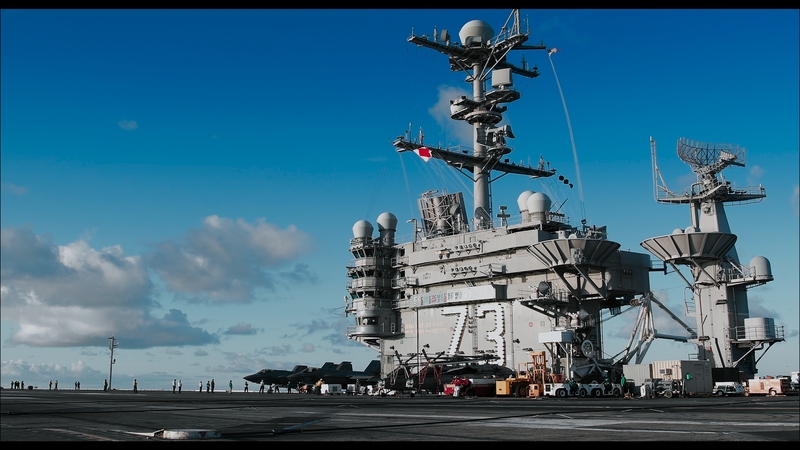 Aboard the carriers, everything is color-coded. Bright primaries stand out against the deep grays and ocean blues. HDR work provides a bit of pop, accentuating sun reflecting from waves and especially heightening the glow left from missile trails. That’s not enough to offset the bevy of other problems however. Expect jets taking off to produce booming LFE – and then walk away disappointed. Aircraft Carrier: Guardian of the Seas doesn’t find its aural groove. The subwoofer barely feels engaged, while surrounds manage the score and little else. Predominant stereo use takes up jets panning away from the center, showing some life from this Atmos offering. Narration pops from the center boldly, easily managed given the overall lack of range. Testimonials from audience members leaving an IMAX screening seem like an odd bonus choice since they offer no value to anyone other than marketers. Two cheaply rendered features compare speeds of these vehicles to supercars and giraffes. A bevy of trailers (with HDR) show off Shout’s IMAX line. Following an international military exercise, Aircraft Carrier: Guardian of the Seas produces some marvelous imagery while detailing technology.